This month I have read 9 books and am currently reading (well actually listening) to 1 book. I am also currently listening Ready Player One by Ernest Cline. I am about half way through. This month I purchased a fair few books but I have only received 4 of them in the mail so far. I have purchased 10 books this month, some real copies, some iBooks, and some Audiobooks. The first 3 books in The Mortal Instruments series by Cassandra Clare. I also purchased Miss Peregrine’s Home for Peculiar Children by Ransom Riggs. Lastly, I purchased Throne of Glass by Sarah J. Maas. Lastly, the Audiobooks that I purchased were The Siren by Kiera Cass, The Raven King by Maggie Stiefvater and Ready Player One by Ernest Cline. The Siren and The Raven King were purchased using Scribd and Ready Player One using Audible. I wasn’t specifically tagged to do this, but I’m going to do it anyway! I couldn’t pick just one book! I really enjoyed both of these books. They were both really different from anything I have read before and I just could not put them down! I couldn’t choose just one again. So I Chose This Savage Song by Victoria Schwab and The Glittering Court by Richelle Mead. Even though I haven’t yet read Iluminae this is defiantly the most anticipated read for the second half of the year. Especially because I will be receiving this book earlier than it’s release date thanks to the exclusive Gemina box that The YA Chronicles has available for October. I didn’t really know what to expected from this book as I received it in The YA Chronicles subscription Box and I hadn’t heard anything about it. As I don’t usually read Contemporary books, so I was extremely surprised that I really enjoyed this book! Honestly, I still don’t know how to feel about him, but I chose Ash from The Iron King. Hopefully is actually a good guy, I need to read the rest of the series! Blue from The Raven Boys! I don’t know why but I just love her and I think if I knew her in real life I would make friends with her! I’m an extreme Harry Potter fan! The Harry Potter series is the only books that have ever made me cry! I generally don’t cry, let alone while reading. I loved this book and it made me extremely happy when reading it! My Favourite’s are the Harry Potter series and the Lord of the Rings Series! I also really enjoyed the Vampire Academy Movie and was extremely pissed off when I found out they weren’t going to make movies for the rest of the series! This book is absolutely Gorgeous! This image or photos of it really don’t depict what it is like to actually see the book. I am talking about the paperback version as I have never seen a Hardcover edition in real life only in videos and photos. I tag anyone who wants to do this tag! Saw this tag on @readatmidnight blog and thought I would join in! All the question images were made by her also! Well, the first book I actually read was Tomorrow Where the War Began by John Marsden, which I loved, I read when I think year 9 or 10 for my English class. However the book, well actually series, that started my love for reading was the Trylle Trilogy by Amanda Hocking. I received the first book, Switched, with a Dolly magazine. After I read it I had to get the rest of the series. Ever since then I have loved reading. The Harry Potter Series by J.K. Rowling! Do I need to say more!? The Fault in our Stars by John Green.. I got so sick of hearing about this book especially around the time when the movie came out. So I have never bothered reading it. I have watched the movie, as a friend made me, watch it and I didn’t really enjoy it, so I now feel no need to read it. I don’t really know what to chose for this as I really don’t have a problem with tropes and I don’t really think about them when I am reading. I don’t have a series or book that I am avoiding because of its size. If I feel like reading a book I will. Also I don’t really own any overly huge books except the A Song of Ice and Fire by George R.R. Martin. I started reading this series but stopped, not because of size, because I was having to force myself to read it and I was not enjoying it AT ALL. The Raven Boys by Maggie Stiefvater defiantly kept me up. I just couldn’t put this book down. This was handy as I read this book for the ‘Read a book after midnight’ challenge for the BookTube-A-Thon 2016. Uhmm, Harry Potter! The Cursed Child just around the corner and Fantastic Beasts and Where to Find them coming towards the end of the year!! So keen! For me, a surprisingly Awesome book was The Unexpected Everything by Morgan Matson. I generally don’t read Contemporary books so I was surprised that I really enjoyed this. I have started reading more Contemporary novels now and I have discovered that I actually enjoy them. The Harry Potter series! I want to own every version of these books! Especially the Special Edition Paper Back Box set that creates the Hogwarts castle when in the box. However, I am too broke for that! I also want to own the Original (I have Philosopher’s Stone already) and Deluxe Editions of the illustrated copies. Of Fire and Stars by Audrey Coulthurst. Ah, duh! The Cursed Child! I tag anyone who want’s to do it. Very fun and some challenging questions! Was so excited when I saw this Read-A-Thon come up! Created by Aentee @readatmidnight, this tag is new and exciting and I have never seen anything like it before! This challenge is a 3 week Read-A-Thon taking place from the Sunday 14th of August until Sunday, September 4th. The Challenge has 8 challenges that relate to 8 gyms in Pokemon. With this challenge, you read 8 books and can also choose to participate in a point (CP) scoring challenge. To check out the announcement post go Here. All of the challenge images were made by @readatmidnight! I have chosen Blitzle. He is a 2-stage evolution Pokemon. The second stage being Zebstrika. He gives me a starting point balance of 10CP. For this challenge, I will be reading City of Bones by Cassandra Clare. This book has been on my TBR list for a while! I will be reading this book last as it is a series and I want to be able to continue on to the next book in the series straight after this one. For the next challenge, I will be reading The Book Thief by Markus Zusak. I’m not sure if it will actually make me cry as the only book I have ever cried in was Harry Potter and the Half-Blood Prince. So we will see. Firstly can we just talk about this gif that I found that fades from the dust jacket cover to the actual book cover! This is fabulous. Good work Google! I choose Illuminae by Amie Kaufman in particular because I am receiving Gemina in the exclusive Gemina Box from The YA Chronicles in October and I wanted to read Illuminae before I get it. I have heard tonnes about this book and there is so much hype for it! I chose to read a book with LGBT in it as a part of Diversity. So I chose Aristotle and Dante Discover the Secrets of the Universe. I have heard mixed reviews about this book, so will see how I feel about it. I am also trying to read more contemporary books, and this fits. Next, I chose Anna and the French Kiss by Stephanie Perkins. Another book that I have heard a lot about on BookTube, mostly positive. Also Another Contemporary! For this challenge, I will be reading Miss Peregrine’s Home for Peculiar Children by Ransom Riggs. I was meant to read this book for the BookTube-A-Thon but never got to it. I have seen this book a million times on BookTube. I read a lot of Fantasy books so this was a pretty easy book to chose as my TBR for Fantasy reads is pretty extensive and I just had to choose one. I have heard so much hype about this book especially now that the movie is coming out soon, or is out in cinemas? I have no idea. Me Before You by Jojo Moyes defiantly has read on its cover and it’s also another Contemporary. Go me! World War Z by Max Brooks has also been on my TBR for a while so when I saw this challenge straight away I thought of this book! I am joining a bit late – 25th July – but oh well! I am aiming for the rebel badge! as I am already half way through the year, otherwise I would aim higher. For more info, sign up, levels and everything else go Here! 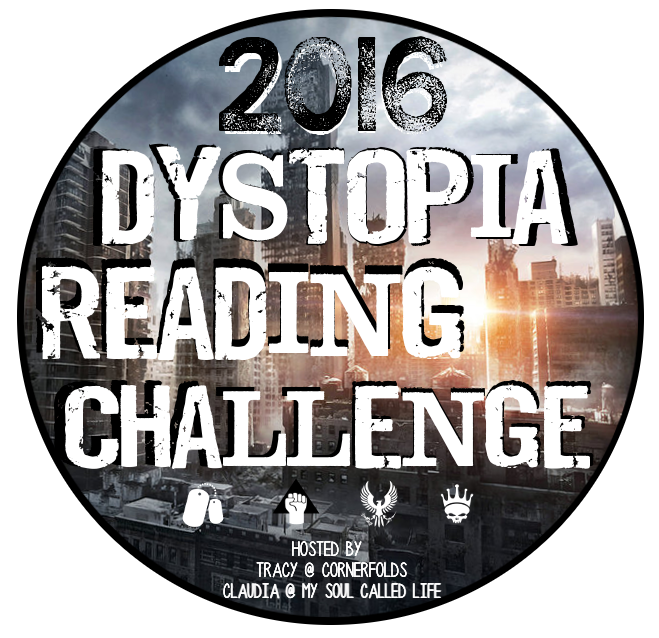 So far this year I have not read ANY Dystopian books but there are a fair few on my TBR! I know I won’t finish all these in 2016, especially since most of these I don’t even own yet. Bank account please let me buy books!! I also have a lot of other books on my TBR that aren’t dystopian. This book had been sitting on my TBR list for a while and for the BookTube-A-Thon I finally picked it up! I don’t know why I left it so long this book is amazing. This book is written from the point of view of Meghan Chase. I love the writing style in this book. There is a lot of information to take in, within the world of this book and Kagawa made it so that you weren’t bombarded with information but it was gradually added chapter by chapter. I defiantly don’t know everything yet as I need to get my hands on the other books in the series, but so far I have a good foundation to work on. This book is full of adventure, action, romance and forever having to change plans at the last second. It’s thrilling and makes for an easy read. I did read this book as part of the BookTube-A-Thon but even if I hadn’t I think I could have read this in 2 days easily. It’s such a fast-paced read and you don’t want to put it down! Within the story, Machinery and Technology are destroying natural Beauty, in this case, of Faery Land. I love this underlying meaning as this is beyond true in the real world as well, just in a different way.